The RECOPAK Intermittent Wraparound Case Packers caters for speeds of upto 20 cases per minute. All Machines in the range feature Servo Drive Technology offering the customer State of the Art Performance. 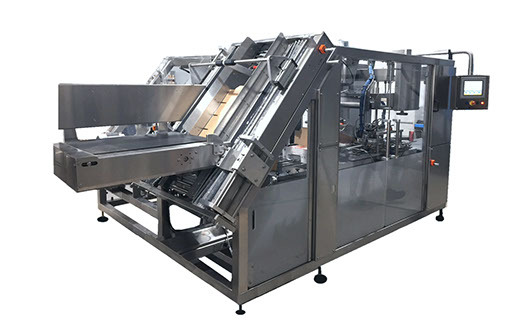 The RECOPAK Wraparound case packer is an intermittent motion machine able to pack bottles, jars, cans or packets into wraparound style cases. This machine features an individually designed product infeed system to meet customer specific requirements. The unique dual servo driven case transfer system enables case length selection to be done via the operator interface screen, eliminating difficult mechanical size change adjustments. The HMI rotates about the centreline of the machine to provide operator control from either side of the machine. This machine can be supplied to handle either Internal or External Glue Lap. Full size guard doors on both sides of the machine offer complete access for operator intervention. Fully Automatic adjusting product paddles guarantee higher reliability and precision when changing to a new carton size. Fully Automatic adjusting product paddles. Swivel HMI Screen allows operation from either side of the macine. Quick Changeover easily configured by hand wheels and metric rulers. Extended magazine can hold approximately 200 case blanks.